Our comprehensive range of activities has been developed to cater for the novice and experienced, young and old alike. If you are unable to find a course or holiday to satisfy your requirements, then we are ready to advise and tailor your own bespoke package to enable you, your family or group to make the most of your time spent with us. Our areas of expertise at Contour Outdoors include: Rock Climbing, Scrambling, Walking, Navigation Skills, Canoeing, Mountain and Road Biking. We also provide multi-activity Family and Corporate Activity Days. Our highly qualified and experienced instructors possess the highest, recognised UK qualifications, and we are all Association of Mountaineering Instructor Members. We have have full public liability insurance which covers all our activities. 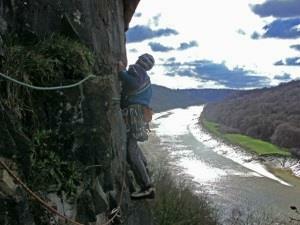 Contour makes the most of what the Wye Valley and Wales has to offer. Our unrivaled local knowledge, combined with experienced and enthusiastic instructors always ensures a safe, memorable, thrilling day out, regardless of age, ability or experience.